where a remnant population survived. "The first peace, which is the most important, is that which comes within the souls of people, when they realize their relationship, their oneness with the universe and all its powers, and when they realize that at the center of the universe dwells the Great Spirit, and that this center is really everywhere, it is within each of us"
"What you do not know you will fear, and what you fear you will destroy"
There is no point in discussing why we should bring the wolf back or what benefits it would have for we two legged creatures and the natural environment until we talk about why we hate and fear these beautiful creatures. We humans have not always hated or feared the wolf. Native American nomadic "hunter/gatherer" societies had a great kinship with the wolf. The wolf was valued and respected by these societies because of its skils that were also essential to the society: strength, agility, keen senses, endurance, the ability to hunt together as one in a group and the ability to adapt to its ever changing environment. The Native Americans strove to copy these traits in their own lives and by doing so managed to coexist with the wolf in a peaceful maner. They recognized that all creatures, big and small, were key pieces of the Great Circle of Life. When the European Settlers arrived however they brought centuries of negative attitudes about the wolf with them. Their or should I say our, since we are descended from these settlers, attitudes were by products of their agricultural based society. They ssaw wolves only as threats to their domesticated farm animals. They were no longer nomadic, but rather settled down and kept crops and horses and cattle. Because they were settled they created stories for the benefit of their children to teach them the benefits of staying in one place, of planning for the future, and controlling impulses. The consequences of laziness, disobedience, and poor planning were illustrated by the stories of "Little Red Riding Hood" and the "Three Little Pigs"
As the new settlers began imposing their narrow minded views of so called civilization on the new continent of North America the wolf and native american fates mirrored one another. The government began offering bounties in the early 1600's for wolf pelts and shortly thereafter native american scalps. 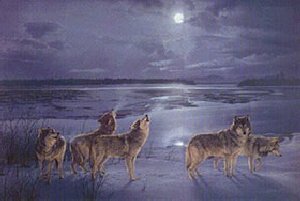 By the early 1900's, because of these terrible and despicable acts the wolf was exterminated from the lower 48 states and the native americans survived only in isolated reservations deprived of their culture and their dignity. 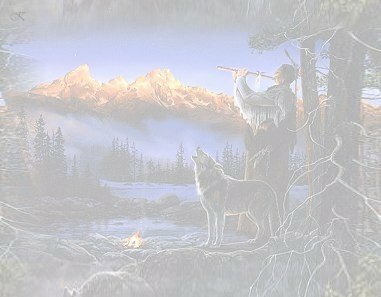 To a vast majority of the new settlers the wolf and the native american symbolized all that was wild and largely untamed in nature, to include human nature, and because of it were to be destroyed as quickly as possible. Our descendants believed wolves were not only a threat to livestock but to humans also as do ranchers, farmers and the residents of today. These fears today are perpetuated today as they were in the past by stories and movies that portray the wolf as agressive and ferocious animals. This couldn't be further from the truth, wolves are very shy creatures and they go to great lengths to avoid us. No Healthy and I will say it again NO HEALTHY wild wolf has ever been documented to have killed a human in North America. I know what you negative people will say, what about the Wild Life Biologist in Cananda that was killed by a pack of wolves? 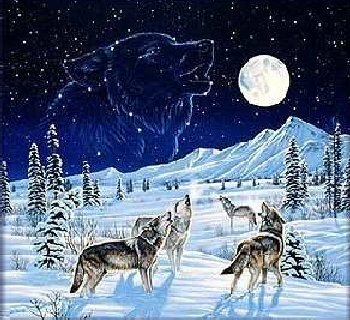 and I will say this those wolves were starving due to a harsh winter and lack of natural prey like deer and elk, that we humans over hunted to begin with, they did what they needed to do to survive he was in their habitat and they were starving. So read above NO HEALTHY wild wolf has ever been documented killing a human in North America. Where wild prey is plentiful, livestock loss is very rare especially when you compare the losses to disease, other predators and harsh weather. The idea of wolves being worthless vicious vermin began to change in the mid 1900's when biologists began looking at the wolf as playing a key role in the natural world. The role of the wolf in the ecological system is very complex and important. It has been shown that where large predators are present, ecosystems are much more healthy, more resilient, and much more complete than ones where they are absent. Take for instance, Yellowstone National Park in 1988-89 when there were no wolves present. Elk, Bison and deer herds were huge and unchecked, because hunting is illegal in National Parks and there were no natural predators to thin the herds. These huge herds led to over grazing which led to an out of balance ecosystem. This coupled with a harsh winter in 1988-89 led to the starvation of thousands of Deer, Elk and Bison, would this have been different if there had been wolves present? Biologists believe so. 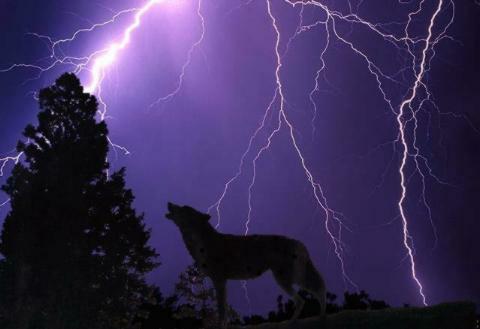 Wolves are not magical they can't bring natural balance between predator and prey they need help. There are many other factors that come into play: weather, disease, food supply and other predators such as coyotes and humans to bring about balance.But wolves do positively influence prey populations and help create a "natural balance". The wolf sits at the top of the food chain with other large predators, and because they do they are an indicator species for the whole ecosystem. To illustrate, where wolves are thriving, sufficient prey is thriving, sufficient forage is thriving, so it stands to reason if one of these pieces is missing then the ecosystem is in peril. when we protect areas large enough to support wolf populations we support the preservation of many other species as well. By preserving this fragile and valuable biological diversity, we keep environments that we can continue to learn about the natural process in all its wonderful complexity. So I ask you, Do we need the Wolf? I believe you know my answer already. I will be back with More to come...in the mean time check out my galleries or sign my guest book.